Becky's Child Care owner, Rebecca Anderson, Arrested After Inappropriate Behavior In Mesquite - Dallas Daycare Negligence Attorney Speaks Out On Incident This daycare owner gave children doses of over-the-counter medicine, and mistreated children under her care. 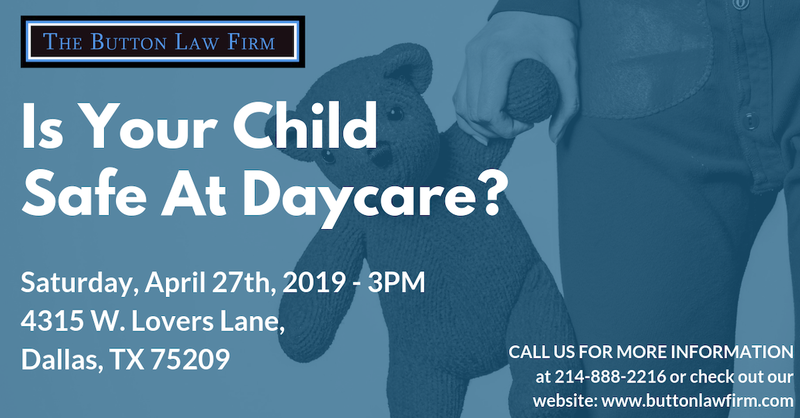 Check Out Our Video Series On How To Find A Safe Daycare By Dallas Daycare Injury Attorney The Button Law Firm is providing free information for parents searching for a daycare! Negligent Daycare Didn’t Realize Toddler Escapes Daycare - Texas Daycare Negligence Attorney Speaks On This Issue Texas daycare center allowed a child to walk out of the daycare facility. The child’s death was in danger and they blamed it on the child. You won’t believe where the child was found. At-Home Daycare Owner Tempered With Evidence In Child’s Death Due To Negligence In Houston, Texas This at-home daycare owner lied multiple times to the police while they were investigating a death that occurred at her home. Read more about it here. 6-Month Old Dies At Daycare Due To Daycare Provider’s Negligence No parent should ever have to bury their child. Read about what happened at Our Little Hopes And Dreams Daycare in San Antonio, Texas. 3 Year Old Dies While Trapped In Van After Daycare Field Trip In Houston, Texas The precious life of a toddler was lost when an employee failed to check if any children were left in the van. Could it have been avoided? Absolutely. Read more about it here. 8-Month Old Abused At Houston Daycare Center Mother finds bruises on her son’s arms caused while at daycare. Read more about it here. Infant Shy Of Three Months Died While Attending Daycare In Houston, Texas Infant died while attending a family ran daycare, cause of death was ruled as SIDS. Attorney was able to get the mother the answers she was looking for. Read more about it here. Unprofessional And Unqualified Employees Ridiculed A 6-Month-Old Baby Boy In Alvin, Texas Daycare Center Had the daycare workers been qualified, responsible workers they would have known not to post another person’s child on their social media covered in throw up and feces. Read more about it here. Sexual Assault Takes Place In At-Home Plano Daycare Center An at-home daycare owner’s teenage son sexually assaults multiple children under her care. Was this preventable? Absolutely. Read more.